The value of packaging produced in Australia is estimated to be $10-10.5 billion, while it is around USD300 billion globally. The food and beverage sector uses almost 65 – 70% of all Australian produced packaging. It is not difficult to understand the reason for this. As lifestyles across Australian cities become faster and busier, the packaging industry is growing. Busy lifestyles in Australian cities have led to people wanting more ready-to-eat meals on the go, quick, pre-cut, pre-portioned quick cook meals at home or even single serve beverages and quick snacks while they are on the run. Keeping up with the pace of life and the demand for convenience have been the advancements in food packing technology. Today, there are innovative products that are easy to open, dispense from, reseal and store foods fresh for long. Innovations in packaging have made food easier to handle, prepare, consume while maintaining the freshness and quality of the original produce. The new materials are lighter in weight and higher performing. Moreover, the food looks great and appeals to the prospective buyer too. Roughly 60% of these packaging materials are recycled. The balance packaging ends up in landfills where they can take thousands of years to disintegrate completely, releasing toxic harmful gasses in the process. Did you know that many common packages such as potato chip bags or pizza boxes are not recyclable? A typical snack chip bag is made up of multiple layers of foil and plastic. They are light-weight, easy to label and occupy less space on the shelves making them the choice of manufacturers and retailers. However, there is no technology available to separate the layers which is required in order to recycle these bags. As a result, they end up occupying expensive landfill real estate for years on end. A pizza box or other take out containers made of cardboard ought to be recyclable. However, in reality, whenever cheese or food pieces stick to these boxes, they become un-recyclable and head to the landfills. The environment has been a major concern for the national food packaging industry for several decades. This, coupled with pressures from the consumers, supply chain and the Government led to the launch of the Australian Packaging Covenant (originally the National Packaging Covenant). This Covenant has been the key instrument for managing the environmental aspects of packaging in Australia since 1999. Currently in its third iteration, it is a voluntary arrangement between stakeholders of the Australian packaging industry and the key players at all forms of Government. In its current iteration, the Covenant aimed to have reached a target of 70% recycling of all packaging materials by June 2015. According to a report in the Sydney Morning Herald, the Australian packaging industry this target may not be met given the amount of plastic being imported as Australia’s industry moved offshore. The current covenant has been given an extension of a year till July 2016. Consumers have started to care more about sustainability. A web-based survey by The Consumer Network, Inc showed that in the United States, approximately 35% men and 45% women were willing to pay more for recyclable packaging. It is no wonder then, that many large corporates have been investing millions of dollars to come up with sustainable food packaging innovation. In the early 1970s, Ray Kroc, the founder of McDonalds spent millions of dollars on research. Based on the studies done by the Stanford Research Institute, polystyrene was chosen as the packaging material of choice for McDonalds as it was found to be less polluting as compared to paperboard. In 1993, they started using corrugated micro-flute that not only weighed less, used post-consumer fibre, corn starch adhesive and soy-based inks for its manufacture. Another large company which has done a lot to further the cause of the use of post-consumer fibres in the food packaging industry is Starbucks. They spent four years with their partners to develop a cup which contained 10% post-consumer fibres. The FDA approved the cup to be in direct contact with food which began to be used in 2006 and has now been adopted by Starbucks in its locations worldwide. In 2012, Starbucks introduced new hot-sleeves which required fewer raw materials to be made, while increasing the amount of post-consumer content. This new sleeve is currently being used in the United States and Canada. According to the company, the increased use of post-consumer fibre has led to a saving of nearly 100,000 trees. Today, there are many bio-based food packaging materials. These are materials which have been derived from annually renewable sources. The twentieth century had seen the rise of the use of petroleum-derived chemicals as packaging material because of their physical and chemical properties such as lightness, strength, and resistance to water and water-based micro-organisms. The turn of the century saw attention being given to environmental factors such as sustainability and the ability to recycle. Materials from non-renewable sources such as those from petroleum began to be replaced with those from renewable sources, essentially those derived from plants and their by-products. One such innovation is to make products out of sugar cane fibre or bagasse, which is the pulp material remaining after the extraction of the sugar-bearing juice from sugar cane. 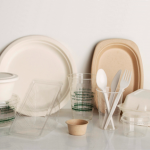 Bagasse can be used for making products normally made from plastic or paper. It also helps avoid the pollution caused to the environment by the burning of the sugarcane pulp after juice extraction. What is more, sugar cane is a readily renewable resource. Products made from sugarcane pulp are fully compostable and will usually compost between 30 – 90 days depending upon the composting facility. Polylactide (PLA) is another plastic like compound made from the fermentation and distillation of dextrose into lactic acid. The dextrose is derived from starch rich plant sources such as corn sugar. PLA behave like a plastic, however, it is made from renewable sources and can be fully composted at a commercial composting facility. Similarly, corn starch and cellulose based polymers are also being used in the food packaging industry. These too are derived from annually renewable sources and take between 45 – 180 days to compost in optimal composting conditions. For sustainable packaging solutions, visit Environmental Enterprises. Environmental Enterprises is a supplier of certified, biodegradable/compostable sustainable packaging alternatives to the market place. For product, pricing & ordering contact Wayne on 02 9634 5697/0417 206 755 or visit their website to learn more. Did you know that using cloth towels instead of using paper towels saves 50% of landfill space from paper wastes? There are continuous towel dispensers that you can install to ensure a hygienic workplace without creating wastes. It can save trees too. Choose the greener option! Recycling at home and work in Australia. One area of our lives that we can all make an effective impact towards healing our environment, and it’s easy is Recycling. Virtually every community in the Australia has either a personal recycling containers/bin or accessible community recycling centers. Being more conscientious about what we throw away and what can be recycled is all we need to do. Remember that its not just at your home, recycle at work. Businesses and workplaces can be some of the worst recycling environments because of inadequate recycling containers or building recycling management. Talk with your office manager about creating places for recycling and increasing communication about recycling to your co-workers. Make certain that your office manager finds out what procedures the cleaning crews might have in removing your recycled material. Get them to also think about using environmentally friendly products where possible! Remember this is one of the easiest ways for us all to contribute. Talk with your family and friends and discuss some of the advantages of recycling and how easy it is to incorporate into their lives. If you do not have recycle recepticles for pickup at your home or work then you can find a local recycle center by visiting the Recycle Near You. Conservation habits to lessen the strain we as individuals place on energy and natural resource consumption. Conservation is a great area where all of us can work on reshaping our habits to lessen the strain we as individuals place on energy and natural resource consumption. There are thousands of ways to conserve energy and natural resources and lots of them you may have never thought of. For instance did you know that an unused appliance, while still plugged into a wall socket, loses between 10% – 40% of the energy consumed during regular use. Go around your house and honestly evaluate all of your lamps, any radios or CD players which may not get used and unplug them while they are not in use. The same goes for any items which may be plugged in & powered up but which never get used, like your VCR (most everyone has a VCR but uses their DVD player instead). The more ways that we can think about conserving and the better we are at sharing those ideas which we all can practice, the easier it will be to get more of us involved. Two of the most identifiable points of conservation for individuals are water and energy use in the home. The majority of our water consumption typically occurs around the home, so identify where your greatest usage would be and look for ways to reduce your use. When you are ready to replace old appliances do so with low energy and low water consuming appliances, change out your showerheads to low flow showerheads and remember to water your lawn and garden after the heat of the day has passed. The energy we use in our homes can come from many different sources including dirty energy sources like coal. Reducing our use of this energy is an effort that must progress hand in hand with creating new production of cleaner renewable sources of energy like wind and solar. A great deal of our home energy use comes from heating & cooling our homes and lighting and by making a small investment and effort we can see huge savings. As individuals we have to take this mindset into the office. I remember an office manager years ago who told us all that all non critical pages of copy printed in the office had to be reused on the blank side for our faxes and other non essential printed material. She setup a box in the office where all these pages to be reused were collected blank side down and we all reused that paper when appropriate. The effect was dramatic, we all participated and after a short while we noticed that not only were we using less new paper but we also noticed that we drastically started cutting back on the amount unessential material we printed. The bottom line is conservation saves money, it saves us from having to produce more new energy, and it is not difficult to incorporate into one.s lifestyle. There are tons of information on what you can do to conserve our resources and our combined efforts can help to stem our out of control use of these resources. Replacing your light bulbs with energy efficient bulbs cost between $3 – $5 per bulb but yield a savings of $40 – $50 per bulb during their lifetime. Energy efficient bulbs typically use ¼ the wattage of traditional bulbs and they last 3 – 4 times as long.g. Adjusting your heating in wintertime and your air conditioning in summertime by 2 degrees can lower your air/heating bill by 25% and saves about ½ of a ton in carbon emissions every year. Buy local! Purchase meats, fruits and vegetables from local producers, most are available at your local market. Fruits, vegetables and meats produced out of state or out of the country must be shipped or trucked to your market increasing each out of state item.s carbon footprint. Also look for organic foods which use less fertilizers and pesticides creating a greener environment. When possible use a toaster over instead of your larger conventional oven for heating up smaller meals, also a microwave will use about ¼ as much energy to heat you meals as your toaster or stovetop. Lower your water use and save money with low flow showerheads which typically cost $10 and can save as much as $80 in water costs per year. Water your lawn after dark to reduce losing water to evaporation during the day. When installing new old hardwood floors or replacing older floors, use bamboo instead of more traditional hardwoods. Bamboo acts like a hardwood, which is perfect for flooring, but bamboo can be harvested every 5 years which means no forests are destroyed. Make sure your car is well tuned and your tires are properly inflated to save gas. Carpool or take public transportation when available. Take your name off of junk mailing lists. The junk mail we receive each year consumes 100 million trees each year and by taking yourself off their lists you will save a fully mature tree every 3 years. Get your information online and save money, unsubscribe to newspapers and save.